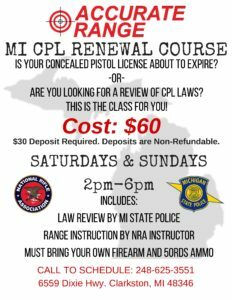 MI Cpl Renewal Course will provide you with a Law review by Michigan State Police. Range Instruction by NRA instructors. Must bring your own firearm and 50 rounds of ammunition. Times are 2PM-6PM Saturday or Sunday.